Whitson's bonus will be for $100K, the maximum amount for an 11th rounder that does not count against the overall team cap. 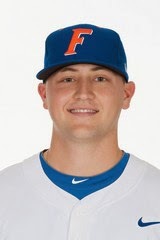 Whitson was the ninth overall pick in the 2010 draft by the Padres out of high school but he decided to forgo professional baseball in order to pitch for the University of Florida. After an outstanding first season in Gainesville where he was named Perfect Game Freshman of the Year, Whitson struggled with a shoulder injury. He was taken in the 37th round by Washington after missing the entire 2013 season, but returned for his senior year. While he had only sporadic effectiveness, his fastball was back to 96 impressing the Red Sox enough to take a chance on him. Whitson enters the SoxProspects.com Top 60 rankings at #50.